Kerch and two estuearies, but without damaging allied ships. 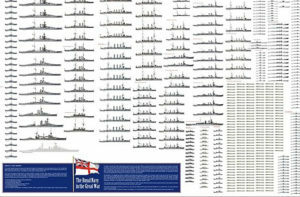 But they at least deterred steam-screw ship of the line Duke of Wellington to trying to approach and attack the twenty Russian sailing ships-of-line at anchor under Kronstadt’s guns because of these “infernal machines” as stated by Charles Napier in his report. After the war, the Russian took not in developments in mines and torpedoes in the American Civil War, Franco-Prussian war, so much so Admiral A.A. Popov organised the first mine warfare school in late 1874, and purchased 100 early Whitehead torpedoes from Austria for testings. Vice-Admiral Popov’s round-hulled batteries were one of these experimental defensive tricks the Russians tried, together with traditional granite-walls fortifications, fortress torpedo launchers and minefields in the 1870s. At the time the Russo-Turkish War of 1877-1878 started, the Russian flet in the Black sea was much smaller in scale than the ottoman navy which boasted then an impressive array of ironclads, often commanded by British mercenary officers. The Russians were just started to remilitarize the black sea after the Crimean war. The response strategy was simple, in three part, first laying 500 mines to cover the port entrance and strategic zones, covered by a two-layer protection, a combination using the famous “Popovska’s” round hull floating battleries designed by Admiral Popov and bearing his name, and coastal batteries. Second, light naval forces comprising the Naval Guards Batallion using steam launches with mines, and three converted steamers used as auxiliary cruisers, while the global strategy was organized by Admiral Makaroff. At some point he ordered six steam launches carried by the Konstantin to attack with a combination of spar, towed, and Whitehead torpedoes. Turkish corvette Itibakh was sunk, and soon the Admiral decided to order more dedicated coastal and sea-going torpedo boats called minonoski: Mina (mine) meant both mine and torpedo in Russian naval usage, torpedo carriers being named minonoski. 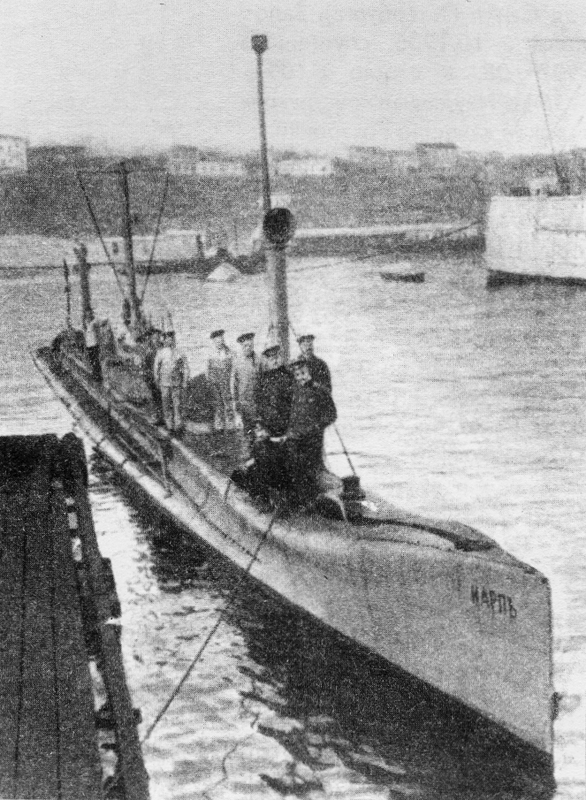 At the same time on the Turkish side, the first Nordenfelt “submarines” were received. The war had quite some influence on future decisions, the Russian decided to create a Black sea fleet at least the size of the Ottoman fleet. Mines and torpedo development was further improved with the launching of a serie of torpedo cruisers in the 1880s. With the 1894 Sino-Japanese war, Russian saw the rise of a new adversary as a threat for its Vladivostock-based Pacific squadron, adressed by the 1895 plan. In addition to torpedo cruisers, attention went soon on building new minelayers, especially the Amur class of 2500 tons. In some circles of the Navy there were also sympathies for the Mahanian doctrine and speculations about new technologies on naval warfare only grew as expectations. When the first operational submarines were being tested, Admiral Makarov clearly warned the admiralty about the potential of this new weapon. He envisioned quite rapidly to built dedicated carriers, in fact submarines-carriers, motherships able to carry nimble, faster submarines to greater distances, including having them released in open sea battles. Karyshev at the same time proposed, without much success a steam-powered submerged spar torpedo ship, and finally a commission was setup and I. T. Bubnov proposed a design to be tested. Baltic yard’s Minonosets No. 113 became later Delfin, the first Russian submarine, a 113 tons, 9 knots torpedo boat armed with Dzhevetsky’s mobile torpedo carriages. Success meant the naval ministry soon ordered ten more submarines of domestic and foreign design. The Osetr was one of these, 137-ton boat, the American-built (Holland type) Som and Losos, and finally the german-built Karp and Karas, from which the German designed their U-boat lineage. These 1904 submarines were by far the best, fastest and with the better range of them all and clearly gave the direction to follow. When the war broke out indeed with Japan, Russian already had 6 submarines, spread between the fleets, but Captain N. Klado asked that all these were dismounted and placed on carriages and sent by rail asap to Vladivostck. In fact, eight were sent by the armiralty, and they soon operated 120 miles from the port, but only spotted once a Japanese steamer and later spotted but missed two destroyers, too quick to be catch. However torpedoes and mines were used proficiently and with much greater success. However the Japanese did the same and improved on “active minelaying” eventually sinking the battleship Petropavlovsk. Before the great war began, programs for more submarines went unabashed, in 1908, it asked for seven submarines, for the black sea and baltic. However Russian well-understood interest for mine warfare led to design the first dedicated design, the Krab. 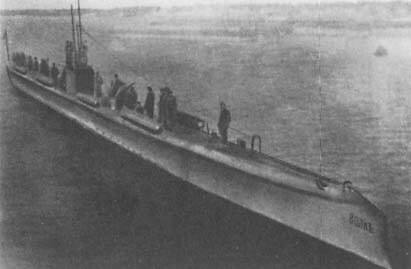 Equipped with two horizontal tubes, she could carry 60 mines, and had a 25 miles capable radio, but she joined the Black sea fleet only in 1915 due to her extremely lenghty development, although she remained effectively the first laid down and launched minelayer submarine worldwide. Another characteristic of Russian submarines at that time (shared with French submarines) was the systematic use of drop-collar Drzewiecki systems for torpedoes. These were external cradles, with some sort of catapult gear and some limited traverse, allowing in theory to launch these torpedoes on the surface, against for example slow unarmed vessels, merchant traffic. polish inventor, engineer Stefan Drzewiecki, designed indeed metal framework that enclosed the torpedo that could be rotated to position to fire in the desired angle, and later using an arm. This system was completely abandoned by the Russians while the French submarines designs of the interwar, up to WW2 still used traversable torpedo mountings in the hull axis, also for surface warfare, and generally of a lower caliber. 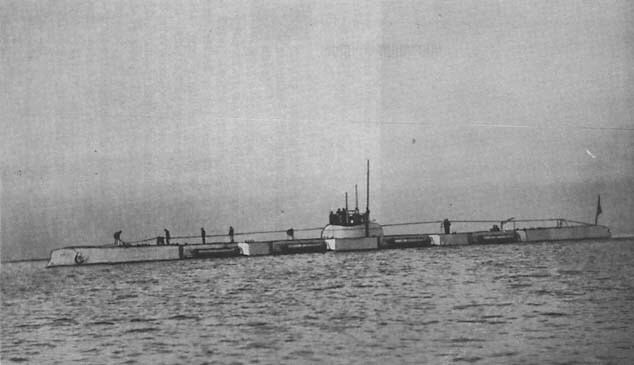 The Bars from 1912 was a considerable improvement, being fast and well-armed, but the naval ministry, reading reports after reports on Turkish growing naval might, ordered two classes of modern submarines, the Morzh and Narval for the black sea, but these were not enough and the war broke out, Russia had only 30 submarines, of which half were obsolete whereas Germany for example had 28 ready al in the baltic and modern. In the baltic, the Russian had to rely on strong defenses based on minefields, backed by coastal artillery especially between Nargen and Porkkala. Long before the infamous K19 or “widow maker” another Russian submarine that had almost a curse since she was laid down: The Delfin. She was quite unlucky to say the least, and gained an awful reputation in service. She was ordered July 1901 and had been designed by Naval architect Ivan Grigoryevich Bubnov, with Lieutenants M.N. Beklemishev and I.S. Goryunov from the Commission for Submarines (The future famous Rubin Design Bureau). 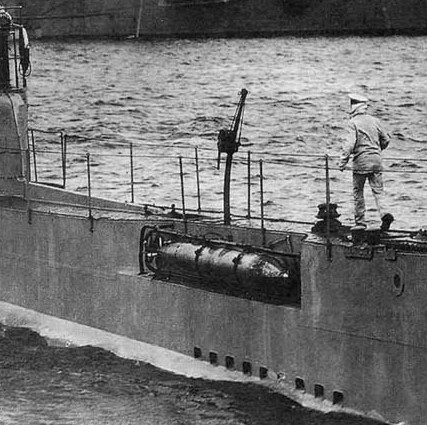 The delfin (“Dolphin”) was a single-hull type submarine with saddle tanks. Oddly its outer plating was doubled by teak to cushion when hitting the sea bottom. It was launched at St. Petersburg in 1902, and commissioned in 1903, first classed as a torpedo boat with a number during its training time. A 113/126 tons (surface/submerged), 19.6 metres (64 ft) long by 3.3 metres (11 ft) boat, she was fitted with ae gasoline/electric enfine rated at 300 bhp (gas. )/ 120 hp (Electric) connected to one shaft for a top speed of 9 knots (17 km/h; 10 mph) at the surface, 4.5 knots (8.3 km/h; 5.2 mph) after diving. It was armed with two external 15 in (380 mm) torpedoes fitted in Drzewiecki drop collars and had one removal machine gun fitted on the surface. Her first sea trials showed faulty ballasts tanks with a more lengthy dive as usual – This would have risen a warning, but later on 29 June 1904 she sank with a great loss of life in the Neva River near the Baltic shipyard during another test dive, with only 12 men being rescued. Raised in July and sent to the Siberian flotilla at Vladivostok (late 1904) she was back in service in February 1905 after repairs and modifications. But the dark serie was not over as she sank this time after petrol vapors that provoked an explosion and teared down the hull. She was again raised, repaired, but when she emerged and returned in service, the Russo-Japanese War had ended. Transferred to Murmansk in October 1916, she served with the Northern flotilla but was judged obsolete in operations and was written off in August 1917. Anchored in Murmansk, she was sunk again (no losses fortunately), this time refloated for the last time and scrapped in 1920. The St. Petersburg Submariners Club still recalls to this day tragedies that occurred with this submarine by a ceremony, wreath-laying, mourning service and making by guards of honor with an orchestra at the Smolenskoye Orthodox cemetery. These six submersibles built at the Baltic shipyards in St. Petersburg were designed by Chief Engineer Bubnov based on the experience and experience of Delfin. It was the emergency program at the dawn of the Russo-Japanese War. The lack of money meant that one of these submersibles was financed by public subscription. The rich Marshal Sheremetev bequeathed his name to him. The lack of engines caused them to be fitted with a single propeller and a single engine, and only the Kasatka was ready in time to be sent to the Pacific. They suffered from their hasty design, with problems of waterproofness and diving behavior that were answered by the addition of external ballasts. All the others were transferred to Vladivostock between September and December 1904, operational in March and May 1905. They saw a difficult service, as much by their defects as by the heavy weather, and were completely rebuilt around a new diesel-electric and with a big kiosk. They could dive 25 fathoms. The Nalim and the Skat were rearmed with a 47 mm gun and transferred in 1915 in the Black Sea, struck off from the lists in March 1917. These submarines flew the Ukrainian colors before being captured by the Germans, before being transferred to the British, and scuttled in 1918. In 1915, the four other from the Pacific fleet were transferred to the Baltic fleet and three more to the Caspian sea, scrapped in 1922. Dimensions: 33,5 x 3,7 x 3,4 m.
Propulsion: 1 prop., 1 diesel, 1 electric motor, 120/90 hp, 8/5 knots Range 1296 km. Armament: 4 drop-collar Drzewiecki torpedoes, 1 Maxim MG. Ordered urgently before the Russo-Japanese war at the St Petersburg Nevsky shipyards, these 7 units (Beluga, Losos, Peskar, Shchuka, Som, Sterlyad and Sudak were designed on a John Holland design under license. 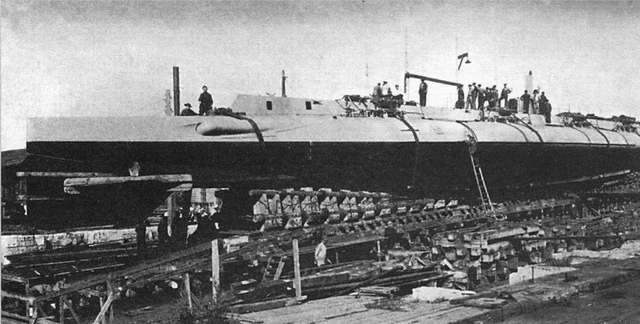 slow on the surface, of a small radius of action (1083 km), but relatively fast in diving.Built in prefabricated sections transported by rail, two units, Som and Shchuka arrived at work in Vladivosock in April and The others arrived shortly afterwards, the Losos and Sudak were transferred to the Black Sea in 1907, and the others then joined the Baltic Fleet, where they were re-equipped with diesel. Two units, the Som and the Shchuka were assigned a few months in the Black Sea, the others being rearmed with a 47 mm, and in 1916 it was decided to withdraw them from service, the Som being lost at sea following a collision with a German freighter. All these units were then assigned to Reval and Sevastopol. The 4 units of Reval were scuttled by the Russians to prevent their capture by the Germans, while two others (Sudak and Losos) in Sevastopol were reassigned to the Ukrainian navy. The latter were captured by the Germans, taken over by the British in November 1918, but scuttled April 26, 1919 to avoid capture by the “red”. Dimensions: 20 x 3,5 x 2,9 m.
Propulsion: 1 prop. 1 fuel engine, 1 electric motor 160/70 hp, 8,5/6 knots surface/dive, Range 1083 km. 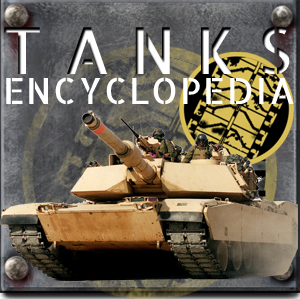 Armament: Origin: 1 Maxim MG, 1 381 mm TT (bow). 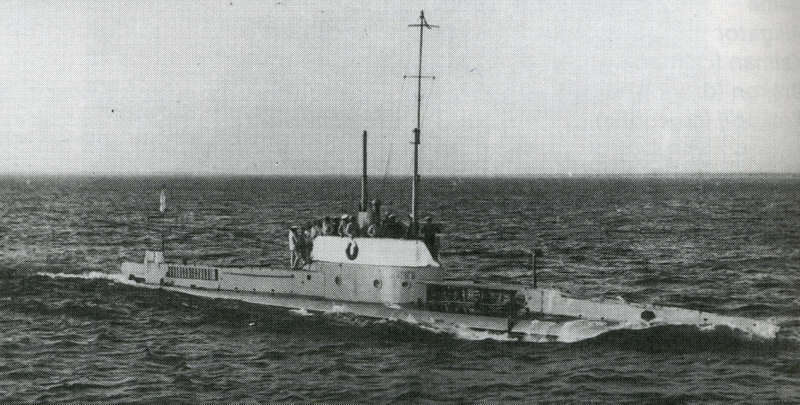 This German-built midget submarine was designed by Spanish Raimondo Lorenzo D’Equevilley-Montjustin and built by Krupp in Kiel, as a private venture by Krupp, first destined to a domestic contract, which never happened. Instead she found a buyer, thee Imperial Russian Navy in 1904. The Forelle served during the Russo-Japanese war and was lost in 1910. She was succeeded by Krab, world’s first minelayer submarine. The Osetr class were built in Russia (Then) for the Imperial Russian Navy during the Russo-Japanese War, ordered in the 1904 emergency program and designed by American Engineer Simon Lake as USS protector. They had in particular retractable wheels fitted underbelly for moving on the sea bed and wet/dry chambers for divers to place mines on a hull for example. 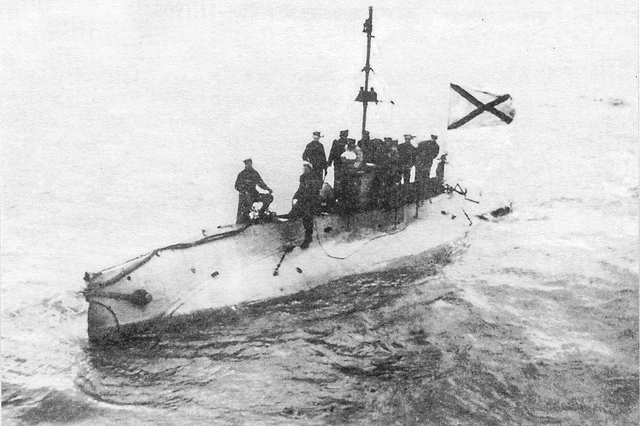 The Osetr was re-assembeld in Russia and in service proved able to dive at 16 fathoms. The class comprised the Bychok, Kefal, Osetr, Paltus, Plotva and Sig. They served untildecomminssion in 1913 and were sold and broken up. This Imperial Russian Navy was designed by Drzewiecki, and built at the Metal Works St Petersburg, funded by Public subscription. This boat tried an already tested Air Independent Propulsion (AIP) system that used gasoline engines using the air supplied by pressurised cylinders, in closed loop. There were 45 cylinders which contained 350 cubic feet (9.9 m3) of air total, pressured at 2500 psi, while exhaust gasses were vented via a perforated pipe under the keel to spread bubbles over a large area or mix these with the propeller’s turbulence. This gave the Pochtovy a 28-nautical-mile (52 km) submerged range in a reliable fashio, however trials showed condensation problems. The wake produced by the exhaust was however visible from the surface and development stopped while the experimental boat was eventually stricken in 1913. These three 100% German units (built at Germaniawerft, Kiel) were commissioned by the Admiralty in 1904 with the emergency program to counter the Nippon threat. They were drawn by the chief engineer of Germaniawerft, the Spaniard D’Equevilley, former right-hand man of Maxime Laubeuf. They also served as a test bench for the very first U-Boote, the U1. 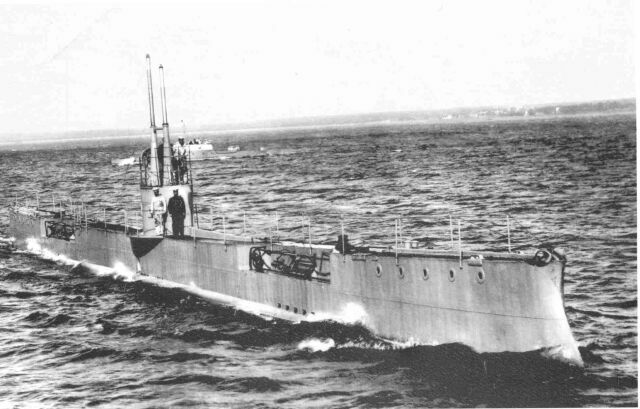 This class which included the Karp, Kambala and Karas had 7 ballasts and a double hull, and could dive to 16 fathoms. Kerosene engines were considered to be far more reliable and efficient than gasoline engines. Their armament was more specifically Russian. Launched in 1907, later than the U1 when the latter was started in the light of the design of the Karp, they were not operational until 1908, after their transfer via the Sevastopol rail in the Black Sea. The Kambala was lost in exercises being violently attacked by the battleship Rostislav, and the two others, inactivated after February 1917, then temporarily Ukrainians, were scuttled on April 26, 1919 by the British who had captured them to prevent their recapture by the “reds”. Dimensions: 39,6 x 2,7 x 2,5 m.
Range: Radiius of action 2315 km. Armement: 1 TT 457 mm (bow)+ 2 Drzewiecki drop-collar torpedoes. This submarine built for the Imperial Russian Navy was designed by Ivan Bubnov as a mix of the previous Minoga and Kasatka-class submarines. The design was approved by the Marine technical committee in late 1905, followed by an order the next year. Built at the Baltic shipyard, Saint Petersburg, launched on 4 September 1907, the Akula swapped soon her petrol engines for safer diesels and the single hull/saddle tank was resistant eniough to dive down to 25 fathoms (45 meters (148 ft)). However soon in service electric motor and propellers showed multiples issues and needed a replacement, but nevertheless the Akula became the longest-range Russian submarine so far. And she was armed enough to perform the world’s first made five torpedoes volley. She served in the Baltic, making 16 patrols and attacked (but missed) SMS Beowulf, until hitting a mine near Hiiumaa in November 1915, sinking with all hands, resting now 30 meters (98 ft) depth since. Four American Lake type units, very much inspired by the USS Protector, were ordered from the Crichton shipyard in St Petersburg in 1906. They were also designed to serve in the Pacific off the coast of Japan, so their range and armament was increases. This class included Kaiman, Krokodil, Drakon and Alligator. They were not accepted in service until 1911, because in 1910 their construction had revealed so many defects and defects of form that the admiralty refused to pay them, but had them seized to prevent the yards from reselling them to the stranger, and had them profoundly modified. 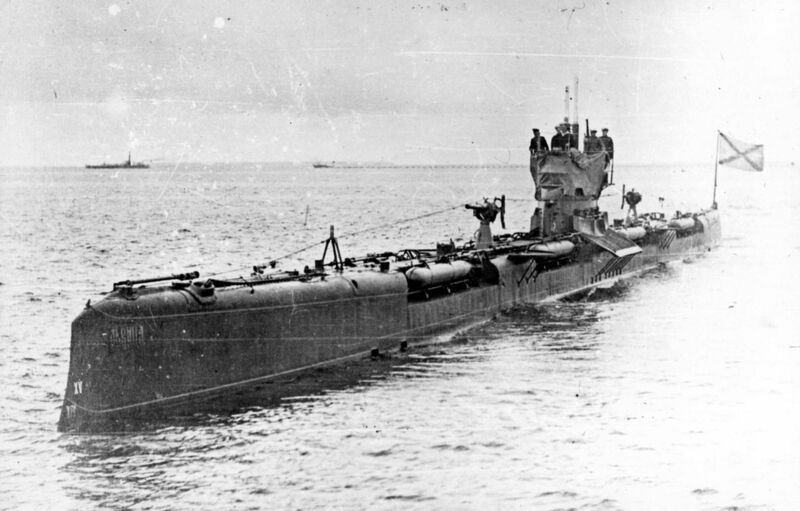 Among other things, a modification of the pumps allowed them to dive in 3 minutes instead of 10 initially, the removal of a section of cylinders on the engines which made them save weight (overweight raised by 12 tons), and had them rearmed with two surface Drzewiecki torpedoes, and at the beginning of the war, with a 47 mm piece (37 mm on the Drakon) and a machine gun. 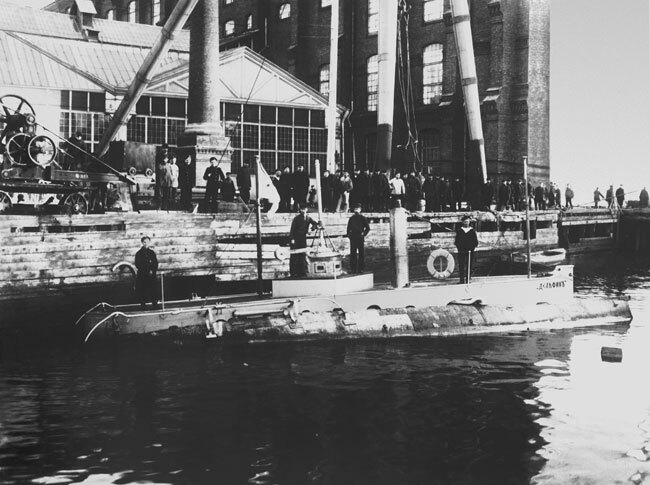 They were assigned in 1913 to the 2nd, then 3rd flotilla of Baltic submersibles, operating against the German traffic in 1914-15 (capturing and sinking cargo ships) but in 1916 their crews were assigned to other more modern units and they remained inactive at the dock, before being scuttled February 25, 1918 to avoid their capture by the “red”. The following characteristics are original. Dimensions: 40.2 x 4.3 x 4.9 m.
Propulsion: 2 propellers, 2 gas. engines, 2 elect. motors 1200/400 hp, 10.5/7 knots surface/dive, RA 1944 km. Armament: 4 TLT 457 mm (2 bow and 2 stern). 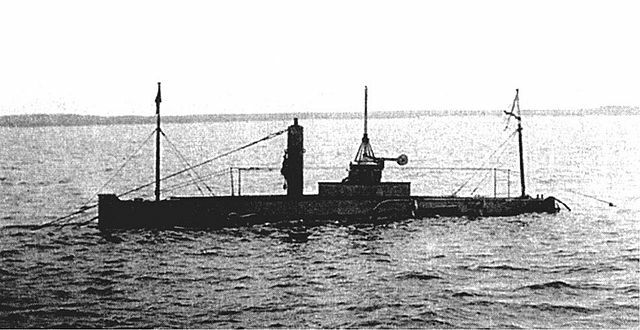 Krab was only a submarine among others developed in Russia. Yet she was the world’s first minelayer submarine. Designed by engineer Naletov from the Nikolayev Shipyard’s design office, she was intended for the Black Sea Fleet. Her construction was long, because in 1908, plans were ready and she was on hold. But many changes came in such a way that she was not finally commissioned before 1915. At that time the Germans were already deploying large quantities of minelayer U-Bootes of the more modern UC model. The Krab was very wide (1/6 ratio) and deep (4 meter draft), armed with two prong tubes and two Drzewiecki outer torpedoes in addition to onboard artillery. Her 30 mines were housed in two large lateral tubes and layed from the rear, carried by an electric “chain”. The Krab could dive down to 25 fathoms. Her first mission was to lay a minefield in front of the Bosporus. The Turkish gunboat Isa Reis was blown up on one of her mines. She carried out a second similar mission in front of Varna, and this minefield sank and damaged the Bulgarian torpedo Shumni and Strogi. In April 1918 she was shortly in the service with the white “Ukrainian Navy”, but passed into the hands of the Germans, then British, before being scuttled on 26/04/19 to prevent her capture by the Soviets. Dimensions: 52,8 x 4,3 x 3,9 m.
Performances: Speed 11,8/7,1 knots surface/submerges, Radius of action 3130 km. Armament: 1 x 75, 2 MGs, 2 x 457 mm TTs (bow), 2 Drzewiecki drop-collar torpedoes, 30 mines. 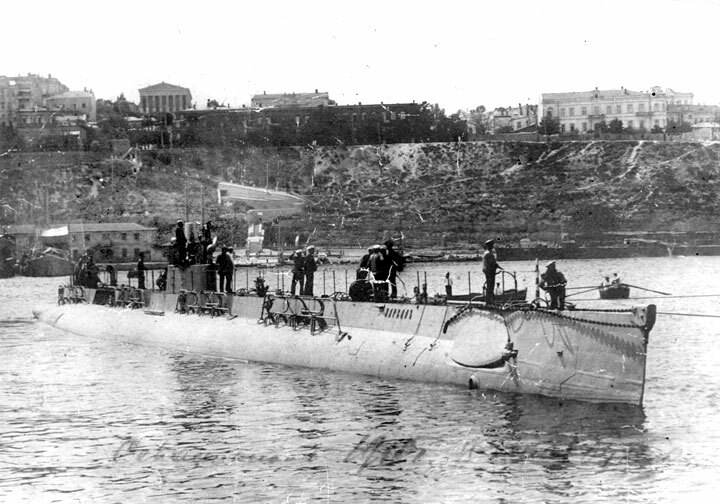 The Morzh class was part of an ambitious program devised by the Naval General Staff in 1909 and part of a class of six submarines for the Black Sea Fleet. 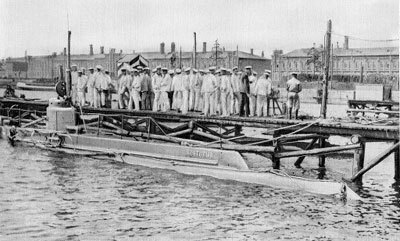 But it was underfunded and delayed until 1910, allowed only in a portion by the Duma but which inclued these six submarines. Three of the Narval class submariness were ordered and the other of the Morzh-class that were to test solutions and builders advances. The former indeed was a Holland design, while the Morzh was based on the succesful Akula. Yet again this was a design by Ivan Grigorevich Bubnov at the Baltic Shipyard in 1910. The blueprints were approved on 30 May 1911, the keels being laid down at Nikolayev shipyards on 25 June 1911. Maneuverability and stability were at the hear of the design, but the lack of internal watertight compartments provoked a stir between submarine engineers on one side and submariner officers on the other. The first argued the solution would improve survivability while the second were afraid of losing control of the crew, financial constraints eliminated them in the end. in addition to their deck gun, the Morzh had four bow torpedo tubes and eight external torpedoes in Dzhevetskiy drop collars. However their single hull made them slow divers with a diving depth limited to 25 fathoms (50 m/150 feet). The two German-built 1,140 hp diesels were not delivered in 1914 and were replaced by inappropriately weak Amur River gunboats Vikhr, Vyuga and Uragan type diesels rated for 250 hp instead. Neither the 16 knot designed speed could not be met, but neither the 12 knots underwater because of the badly designed hull shape. The Bars class derived from these had the same defects. The Morzh, Nerpa and Tyulen were transferred to Sevastopol between December 1914 and March 1915. 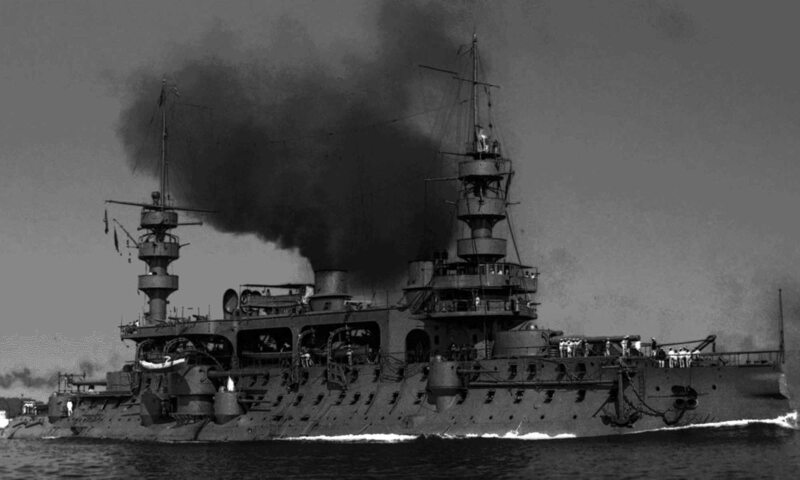 The Nerpa sailed first in March 1915, and the vessels operated off the Bosporus, ambushing Turkish freighter routes. They sank 16 merchant ships in total. The Morzh missed the best Turkish ship by then, the Yavuz in November 1915. She was attacked by air in May 1916 but survived, only to sink with all hands in May 1917 probably because of a mine. The Nerpa was refitted in 1917 in Nikolayev but this never was completed because of the lack of parts and personal and she stayed there until the end of the war. On 3 June 1922 she was recommissioned by the Soviet Navy as Politruk, then No. 11 in 1923, but was decommissioned on 3 December 1930. The Tyulen made the most of these kills and even captured the armed merchantman Rodosto (October 1916). She was captured by German troops at Sevastopol (May 1918), passed to the British in November, and the White Russians (Wrangel force). She fled to French-ruled Bizerte (Tunisia) in 1920, interned, sold in 1924 and scrapped in 1930. These three units (Narwhal, Kit, Kashalot) were the largest Russian submarines of the war, with more than 1,000 tons fully loaded diving. The Narwhal, the Kit and the Kashalot were buuilt at Nikolayev’s Nevski shipyards for the Black Sea, scheduled for 1911. A double-hull Holland-style mixed design, capable of diving at 25 fathoms, they had an internal ballast arrangement complex, including a special compression dive tank, in case of crushing, and a completely hermetic internal compartimentation. Excellent by their safety, erformances and range, they put together a beautiful hunting board at the end of their operations, siking all three 8 freighters and 75 coasters total. They diverged however in armament, the Narwhal (heavier and faster of a knot) had no guns but two machine guns, and four outer torpedoes instead of eight. The Kashalot had only one machine gun and the Kit none. In addition, in 1917, They had two less external torpedo drop collars and two 75 mm gun instead of one, plus two 7.62 mm machine guns. They knew the fate of many other Russian units of the Black Sea: For a time Ukrainian, then captured by the Germans, taken over by the English and scuttled to avoid their capture by the Bolsheviks in April 1919. 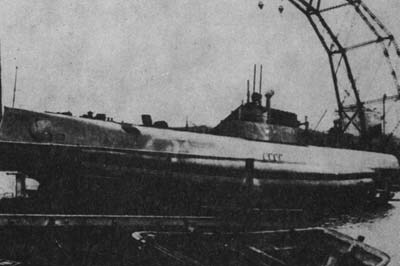 The submersibles of the class Bars (“bear”) were developed by the engineer Bubnov and based on the three Morzh (“Morse”), themselves from the Akula and Minoga. 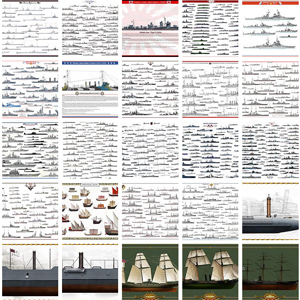 In the 1912 program, 12 were authorized for the Baltic Fleet and 6 for the Siberian (then Baltic) fleet. In the program of 1915, six for the Black Sea, 24 in total. 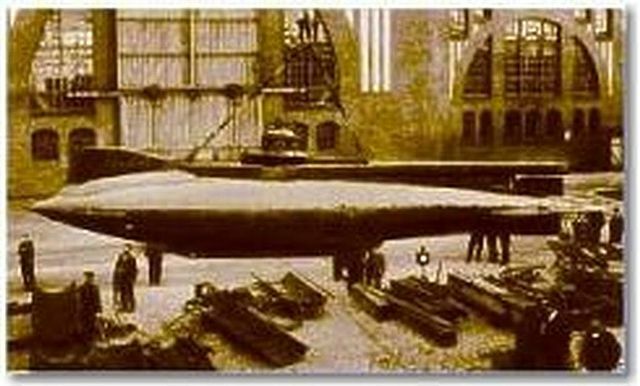 This was the “standard” Russian submarine of the First World War: Built at the Baltic shipyards in Petrograd, Roblessner at Reval, or the Nikolayev Imperial shipyards, they were launched in 1915-1917, and sometimes completed very little of time before the revolution. They had flaws, however, including a range and insufficient depth of diving, a dive time quite slow (more than 3 minutes) because of the choice of pumps, and they were quite conspicuous dive because of resurgences of water (real geysers) at both ends. Well armed, they had no less than 12 torpedoes, but were not able to cope with comparable German U-Bootes much more advanced. There were also difficulties in producing their diesels and they were re-equipped with machines taken on gunboats or imported. Forel and Ugor were modified to become mine anchors (42 in two tubes). With regard to the 8 merchant ships sunk and because of their repeated breakdowns, and their losses in combat, they were considered mediocre. 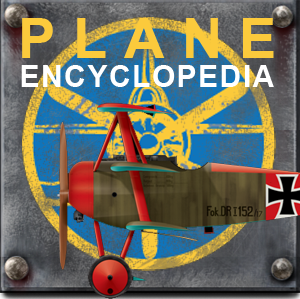 4 Others will be scuttled to avoid capture, and others scrapped between 1921 and 1931. Dimensions: 68 x 4,5 x 3,9 m.
Propulsion: 2 shafts diesels, 2 elect. motors 2640/900 cv, 18/10 knots surface/submerged, Radius of action 740 km. Armement: 1 x 63, 1 x 37, 4 x 457 mm TTs (2 proue, 2 poupe), 8 external Drzewiecki drop-collars. 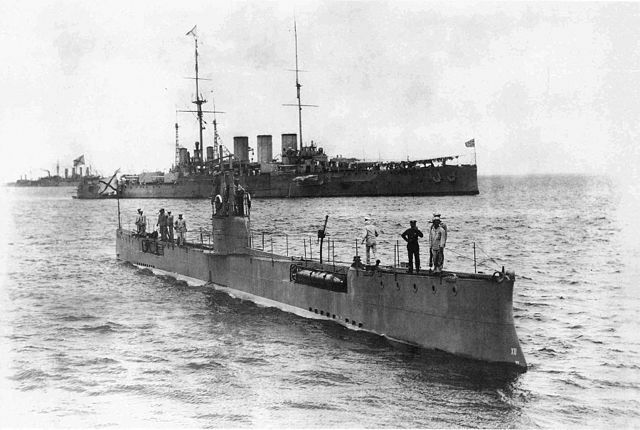 The last Russian Submarines of WW1 were of American construction. These last models assembled in Russia before long had the misfortune to be caught in the turmoil of the revolution. Added to the 1915 emergency plan for the Baltic and the Black Sea, they were designed on American plans from John Holland’s workshops (AG stands for Amerikanskij Golland), similar to the H-type and more precisely 602GF/602L type built for allies in mass production. They were delivered by sections and assembled to the Petrograd and Nikolaiev shipyards, the first launched in 1916 and the last in 1921. Only a small brigade, the 4th, was operational during the winter of 1916 in the Baltic, including the AG11 to 15. The AG13 was lost as a result of an accident, refloated, repaired, and resumed service in 1917 as AG16. The AG15 was also lost in 1917, and after bailout, also resumed service. The AG14 hit a mine in Libau in July 1917 and the other eight had been scuttled in Finland, at Hangö. Four were later integrated back into the United States Navy (H4-H8). The Black Sea ships were only completed during the Soviet era. Apart from the AG27 and 28, captured and integrated into the US Navy, and the AG22 sold for demolition in 1924, the other five served during the Second World War. In 1918, Tallinn occupation and Brest-Litovsk peace treaty had the British flotilla moved to Helsinki, under the protection of the “Finnish Socialist Workers’ Republic”. German landing of the 10,000 strong Baltic Sea Division in Hanko had the result of scuttling the remaining submarines and support ships off Helsinki harbour. Some vessels had to be abandoned like four Russian AGs in Hanko, later scuttled. But two were later raised by the Finns, refurbished, but without proper budget in dire economical conditions within the young state, led to their demolition. The Soviet Navy took over the remaining five, renamed with more appropriate personalities, and were all comprehensively modernized in the late 1930s and renamed again with letters and numbers. 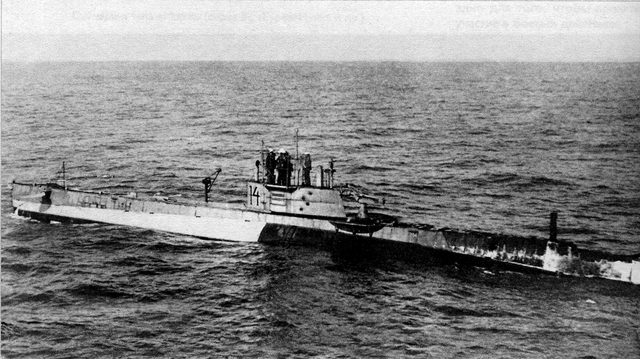 Active in WW2, two were lost: A-1 was scuttled on 26 June 1942 to prevent capture, A-3 was by a German anti-submarine ship. Howeve to her credit, she sank the Romanian merchant vessel Suceava (3495 GRT) in the black sea. Dimensions: 46 x 4,9 x 3,8 m.
Propulsion: 2 propelers, Nelesco diesels, 2 electric motors 960/640 cv, 12/10 knots surface/submerged. Armament: 1 canon de 47 mm, 4 TLT 457 mm (bow and poop). “….the four other Pacific islands were transferred to the Baltic, three to the Caspian,….” how come the Pacific islands are transferred to the Baltic and to the Caspian? No proofreading here, thanks for spotting it !